Stream and record up to 256 video channels with the Ultra Series 256-Channel 8MP NVR from Dahua Technology, at resolutions of up to 8MP. Pre-installed with 48TB of HDD storage, the recorder can be expanded to host 24 hot-swappable HDDs up to 4TB each for a maximum internal capacity of 96TB. External storage options include PCs via Internet connection, network servers, USB storage devices, and eSATA devices. The NVR enables simultaneous live view of up to 68 channels and playback of up to 16 channels via its HDMI and VGA ports, supporting display resolutions of up to 1080p depending on the number of channels being viewed. 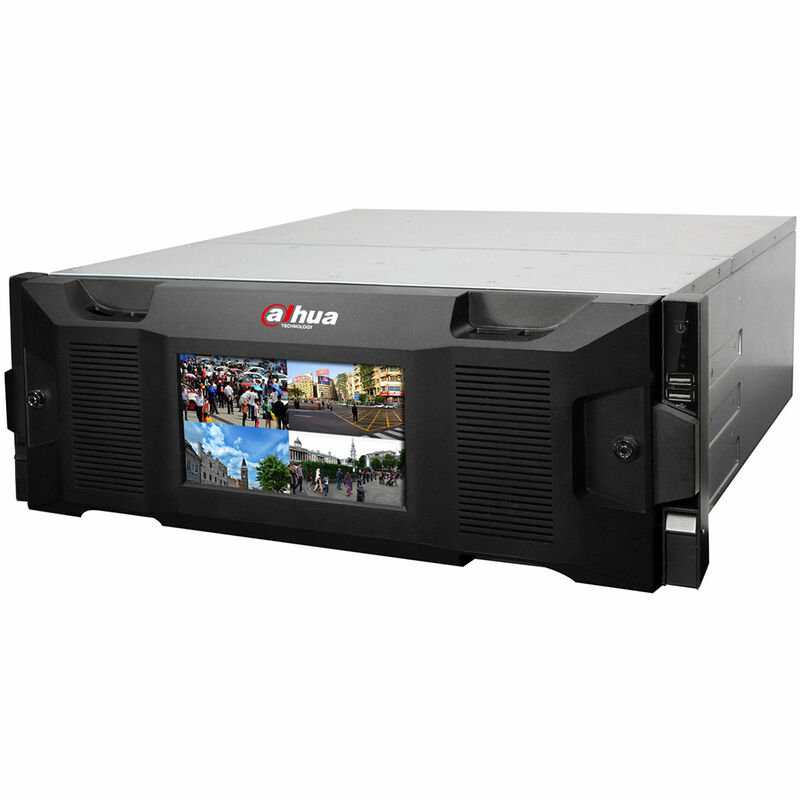 Up to 256 channels can be simultaneously recorded at full frame rate in 1080p, 720p, 960H, D1, CIF, QCIF, VGA, 3MP, 5MP, or 8MP resolution, with a maximum combined transfer speed of 512 Mbps. The NVR is equipped with a built-in 7" LCD screen which supports resolutions up to 1920 x 1080 and can be configured to display video from multiple cameras. Furthermore, the auxiliary interface includes an eSATA port, two mini SAS ports, and in/out connectors for setting up a microphone input. Internet connectivity enables remote monitoring.